As the trend of personalized email grows among marketings and as consumers continue to anticipate increased email personalization, one should expect that if your content isn’t relevant your engagement rates will decline. Here are a few strategies that are aimed at personalizing content by leveraging intelligent data to re-engage your customers. Connecting with inactive customers is an essential part of any companies email strategy. Most marketers consider "inactive" as someone that has not opened or clicked on an email sent recently. Since the frequency of campaigns can vary, it is better to measure the lack of engagement by the number of email campaigns sent rather than a given period. Engage customers by highlighting unused areas of your product. 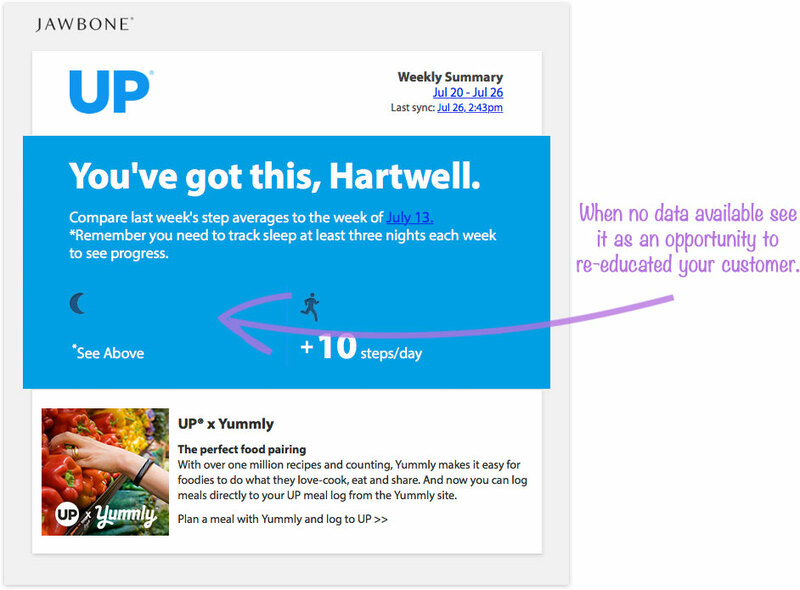 Jawbone, a consumer technology company, most popularly known for their Jawbone UP® personal fitness tracker, sends out an insight digest email weekly . 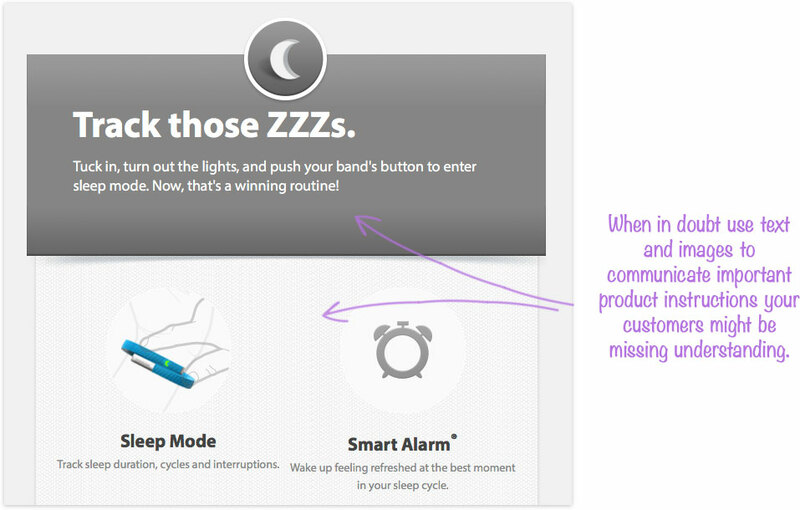 While the Jawbone UP® tracks things steps and sleep patterns, it sometimes can be incorrectly used and therefore falls short of providing benefit to their customers. Jawbone brings attention to behavior like this in their transactional email in two ways. First, you’ll notice the image of my weekly digest email below; the overview section doesn't show any results for sleep. A situation like this (lack of data) could be an indicator of user error, system malfunction or product defect amongst others. Rather than hide this information altogether, Jawbone has directed me to a message that details the requirements to track sleep. Which is important to know if the solution can just be resolved by the user. Second, if we take a look at the next section titled “Track those ZZZs.”, You’ll see they approach this missing data problem from another angle, this time by reeducating the customer. Perhaps the consumer thought that simply wearing the product would activate the feature and is unaware of how to turn this function on entirely. Adding some easy to follow instructions can help manage your customer's experience while improving satisfaction and adding a touch of reinforcement of the benefits of the product. 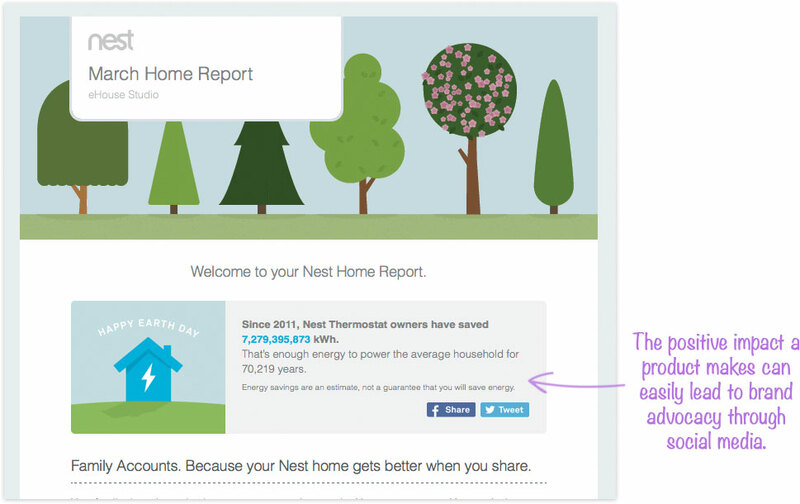 Nest, a company that makes consumer electronics most notably known for thermostats that learn from your indoor climate control behavior, sends out a Monthly Home Report in which it tells customers how much power they have saved. Nest has done this with a few sections in their Monthly Home Report is created content that makes their customers want to boast about using their product. Not only is it a positive message, but it aligns them with a larger ‘cause’ and makes their customers feel good about sharing it. Strategically designing each of these sections with the addition of social share buttons. It’s awesome to think how quickly good-hearted content can transform a typical customer into a brand advocate. If you’re interested in seeing the type of engagement these calls to action are generating check out what people are saying on Facebook & Twitter. Another way to drive customer engagement is to challenge them. 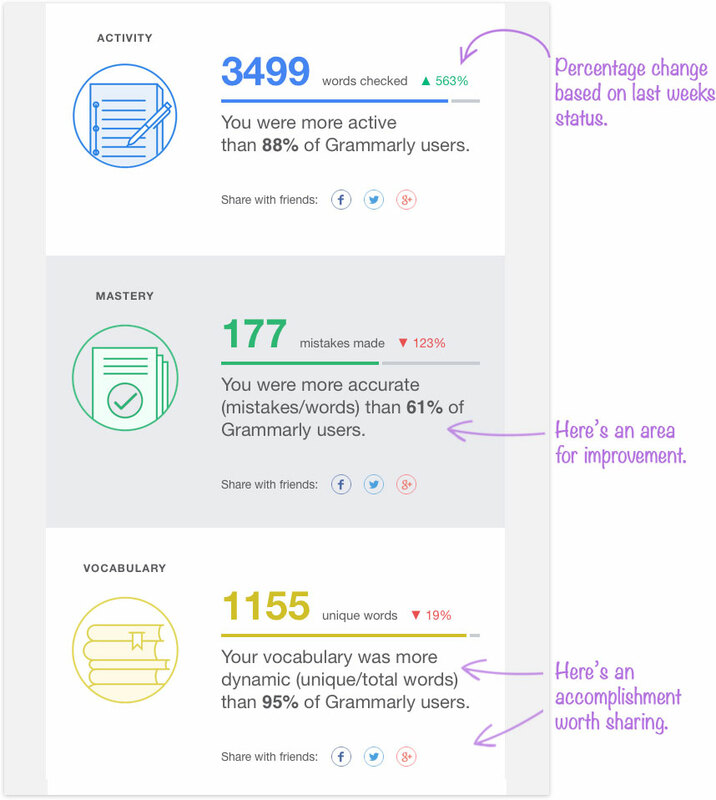 Grammar.ly has done this a couple of ways in their Weekly Progress email. They start out with a status report of your personal literacy performance as compared to the previous week. Noting whether the change was positive or negative. 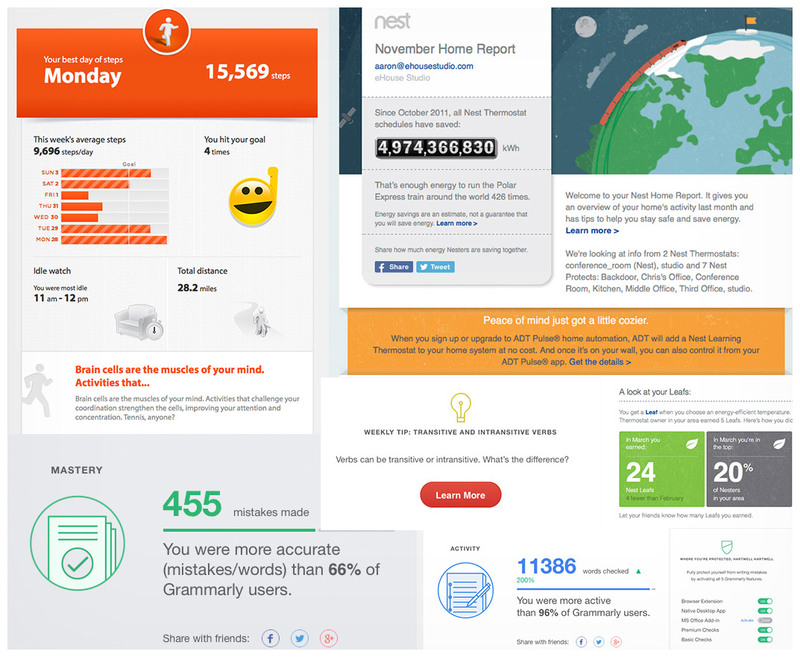 Next, they use your data to indicate how you compare to other Grammarly users. Both of which are an excellent way to put the customer in the competitive mindset. While users may see this as a report card and want to share how well they’ve done. Others could consider it a progress report and challenge themselves to work on areas of improvement like my 3 “Top Grammar Mistakes.” Either way, again we see how leveraging product data that is unique to an individual can help you re-engage the customer through challenges & personalized content. Here are just three ways this email benefits Grammarly. 1. Positioning their product as a personalized learning tool. 2. Allowing you to share your success, and simultaneously promote themselves. 3. Creates incentive for improvement, by continuing to use their product. Remember, continue to test and monitor your new re-engagement email strategy. Analysis of your campaign will allow you to optimize your strategy and create better results. Start testing your theories based on the consumers engagement behavior and discover what works best for your audience. One effective way to do this is by a/b and multivariate testing. For further detail about a/b testing email campaigns check out the knowledge base from our friends over at MailChimp. If you're interested in reading more about Transactional Email, read part one of this series here. Are You Missing Out On The Power Of Transactional Email?